#1 and 2 i've never dealt with. #3 i would look at the roto joint version of UMI LCAs. they allow the joint to twist so that it doesn't pull up on the rear in a heavy turn. you can look for similar LCAs. i have these. they do a good job but they are quite clunky sounding in the bumps. I have the rotojoint lca which are not adjustable. however adjustable should give you the same effect because the joint is on a threaded shaft that will twist. if you are lowering greater than 2 in, then it might be worth it to get adjustable because you may need to adjust for clearance. I'm not sure how much it was. i bought all my stuff at the same time and several years ago. i paid the list price which is now a little over 200 bucks for the pair. i assume the price hasn't changed that much. I with Dustin on 1 and 2. I'm only down 2 inches. No aftermarket steering stuff here. 1 inch spacers all around help a little. In the rear you gotta run solid LCAs instead of the stamped steel. Same for the panhard rod, lower and upper. And some LCA relocation brackets to bring the LCAs back level with the ground. That's one of the most important things. If the LCAs are at an improper angle, the rear will do all kinds of funny things. One thing I often see missed on lowered cars, is the sway bar end links. They need to be shortened the same as the drop on the car. 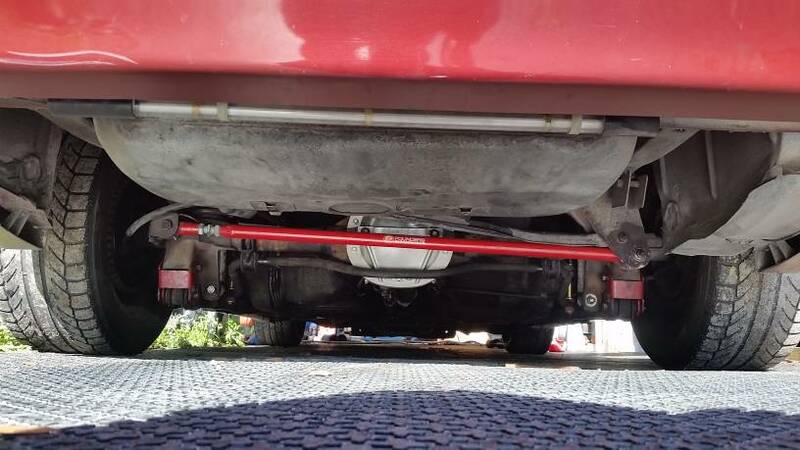 Else they will preload the sway bars and make the car twitchy.